Shell-share production in Nigeria was approximately 365 thousand boe/d in 2012 compared with approximately 385 thousand boe/d in 2011. Security, crude oil theft and flooding in the Niger Delta were significant challenges in 2012. 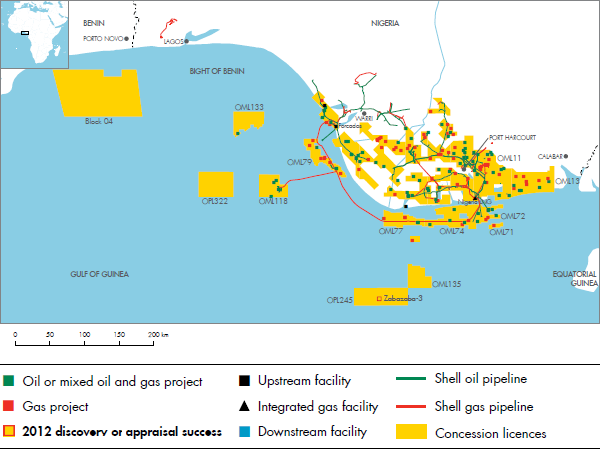 The Shell Petroleum Development Company of Nigeria Ltd (SPDC) is the operator of a joint venture (Shell interest 30%) that holds more than 25 Niger Delta onshore oil mining leases (OMLs), which expire in 2019. To provide funding, modified carry agreements are in place for certain key projects and a bridge loan was drawn down by the Nigerian National Petroleum Company (NNPC) in 2010. The modified carry agreements are being reimbursed, and in December 2012 NNPC repaid the bridge loan with interest. New financing agreements with NNPC are under discussion and are expected to be put in place during 2013. We have a 30% interest in the Gbaran-Ubie integrated oil and gas project in Bayelsa State, which delivered 0.9 billion scf/d of gas in 2012. Gas from Gbaran-Ubie is delivered to Nigeria LNG Ltd (NLNG) for export. In 2012, we sold our 30% interests in OMLs 30, 34 and 40 for a consideration of $1.1 billion. Our main offshore deep-water activities are carried out by Shell Nigeria Exploration and Production Company (Shell interest 100%) which holds interests in three deep-water blocks. 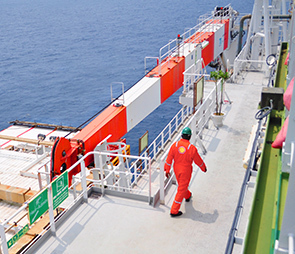 We operate two of the blocks, including the Bonga field 120 kilometres offshore. Deep-water offshore activities are typically governed through production sharing contracts (PSCs). SPDC also holds an interest in six shallow-water offshore leases, of which five expired on November 30, 2008. However, SPDC satisfied all the requirements of the Nigerian Petroleum Act to be entitled to an extension. Currently, the status quo is maintained following a court order issued on November 26, 2008. SPDC is pursuing a negotiated solution with the federal government of Nigeria. Production from the EA field, in one of the disputed leases, continued throughout 2012. Shell has a 25.6% interest in NLNG, which operates six LNG trains with a total capacity of 22 mtpa. NLNG continued production near full capacity during 2012.